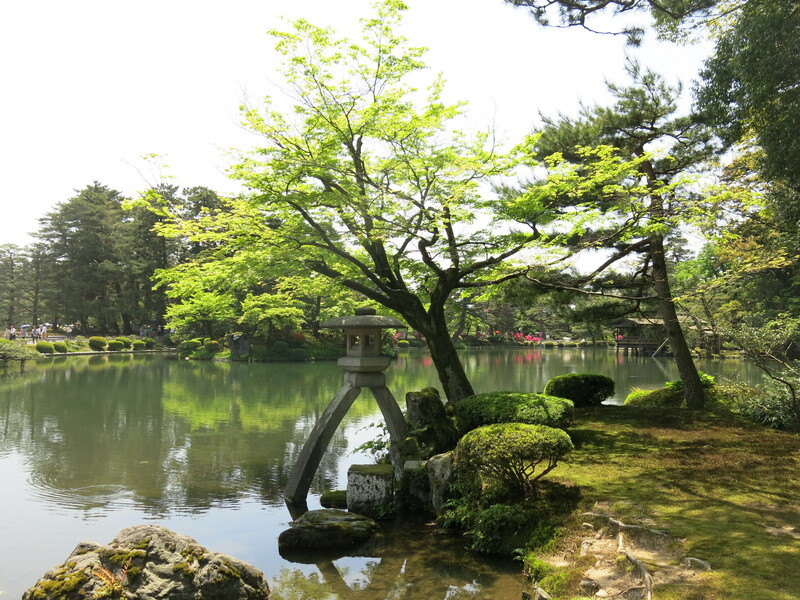 We went by coach from Shirakawa to the city of Kanazawa in Ishikawa prefecture; “home”, as we’d been told by our students “to one of the best three gardens in Japan”. Having had quite an exhausting day in the sun and on a couple of coaches, we treated ourselves to an our of relaxing before having a little wander around to see if we could find something to eat. We settled on Baqet, a restaurant Helen and I frequent in Tokyo being well known for its all-you-can-eat bread accompaniment to the meal. Becca and Wilkes were baffled at some of the selections of flavours on offer, with honey, cherry, sugar loaf and soy sauce bread providing some of the most interesting reactions. Our hotel offered onsen, the Japanese hot springs, and afforded Becca and Wilkes with the opportunity to get naked with the locals. I’d been to one onsen before when we went skiing in Zao last winter, and my abiding memory of it was how so hot the water was that I could barely stay in it for more than about two minutes. That and the aroma of rotten eggs that percolated around the town due to the natural minerals from the mountains. No such smell here (so obviously not as nutrient rich) but still the same onsen routine: take all your clothes off, go in and sit on a plastic stool to give yourself a thorough washing before entering the water, enter the water and avoid trying to see any bits which might scar you for life. 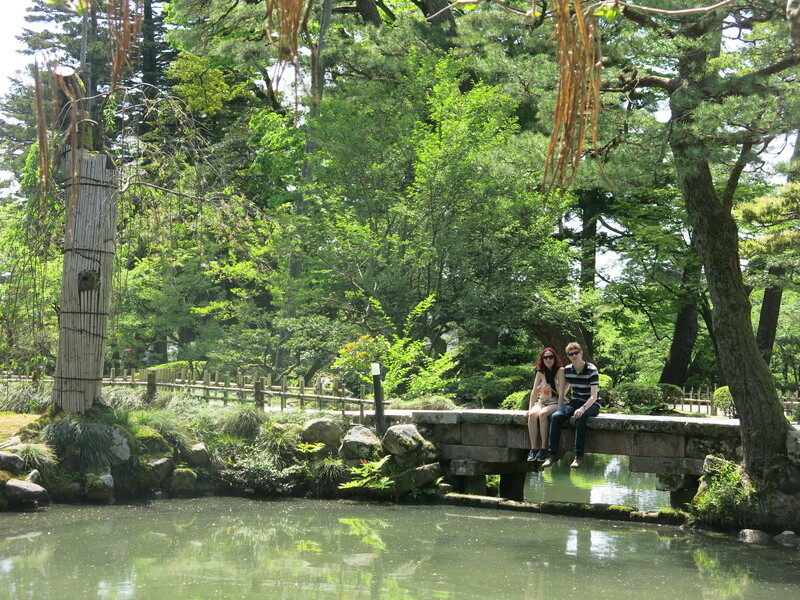 The Kanazawa onsen weren’t quite as scorchio as in Zao so were actually quite relaxing. Just what we needed to chill after the day’s walking. 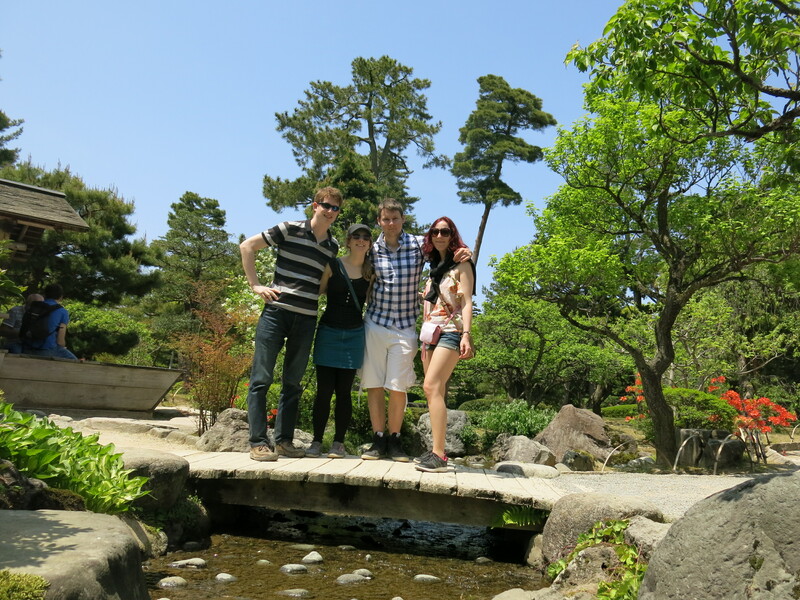 The following day, we awoke bright and early to find the fabled Kenrokuen garden. 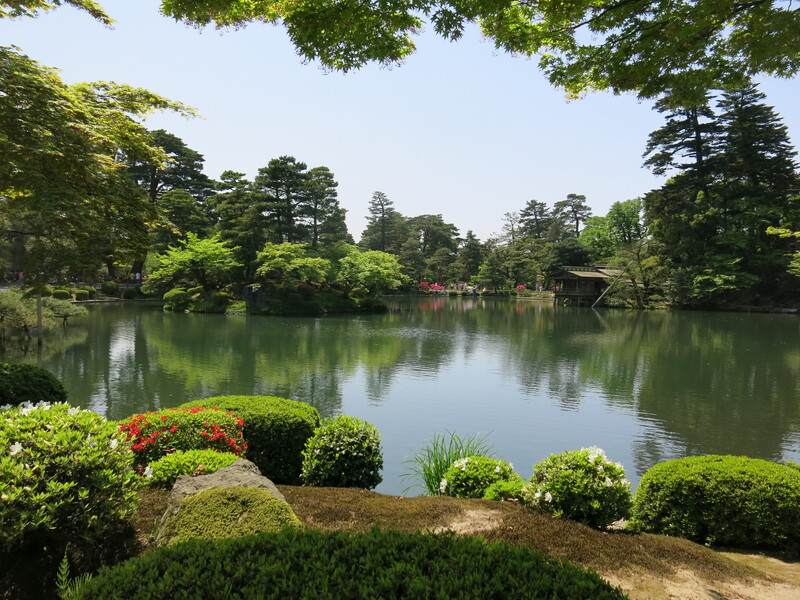 One of the three most celebrated gardens in Japan, it was full of lakes, flowers and contained the oldest working fountain in Japan too. 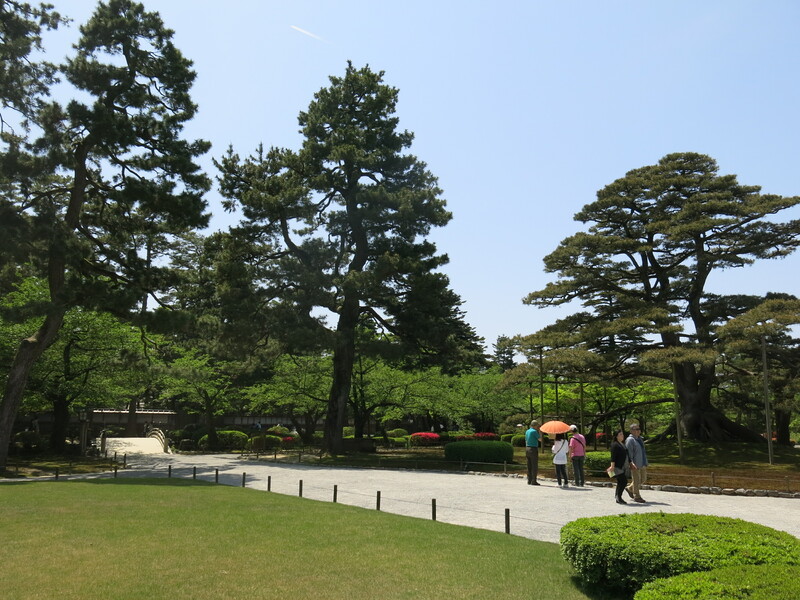 As gardens go it was pretty impressive. 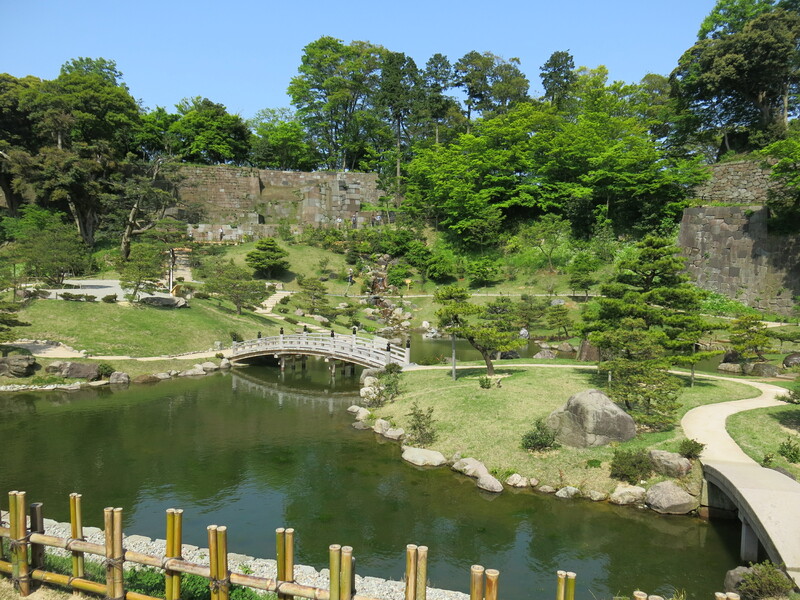 Across the road from kenrokuen are the remains of Kanazawa castle, the grounds of which have been turned into another very impressive garden. Beside another lake, we were told how the castle was used as an army training base during the war, then became a university campus before finally being handed over to the city and transformed into yet another area of great beauty. That evening Becca and Wilkes departed on their way to Kyoto. Helen and I moved to a new hotel and crashed out after a hectic few days! Lots of late nights and days of walking finally caught up with us so we had an early night. The next day, the sun was out again and we decided to hire some bicycles. Kanazawa has a cool system where for a 200 yen fee you can ride rental bikes all around the city, as long as you drop them off at another station within 30 minutes. The stations are generally near all the interesting places so you can have a look around before taking another bike to somewhere else. We had a fun morning caching around Kanazawa on our bikes, and discovered a cool shopping street where a kids brass band were playing some nice songs. After lunch we went back to the station to continue on our journey and return back towards Tokyo. We took the shinkansen to Nagano and then a limited express train to the mountain city of Matsumoto. Matsumoto was a beautiful little city famous for its castle; hidden in amongst the mountains, it was cooler than coastal Kanazawa. 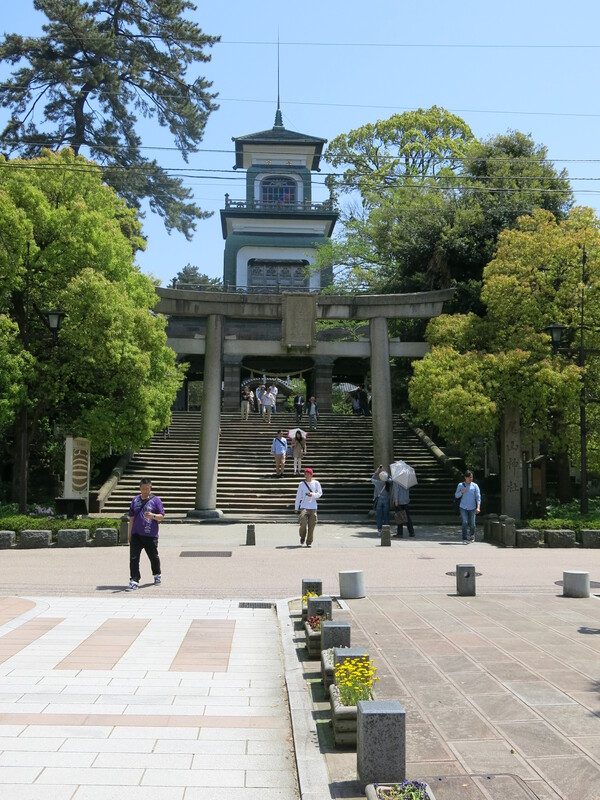 We only spent one quick day in Matsumoto, mostly spent walking around the town. From our hotel near the station, we headed towards Agatanomori Park, which contained a former school building which looked just like how I imagine old English boarding schools to look. We had a quick look around inside, but apart from one room mocked up to look the same as it was when in use, most of the rooms were locked and deserted so a bit boring. 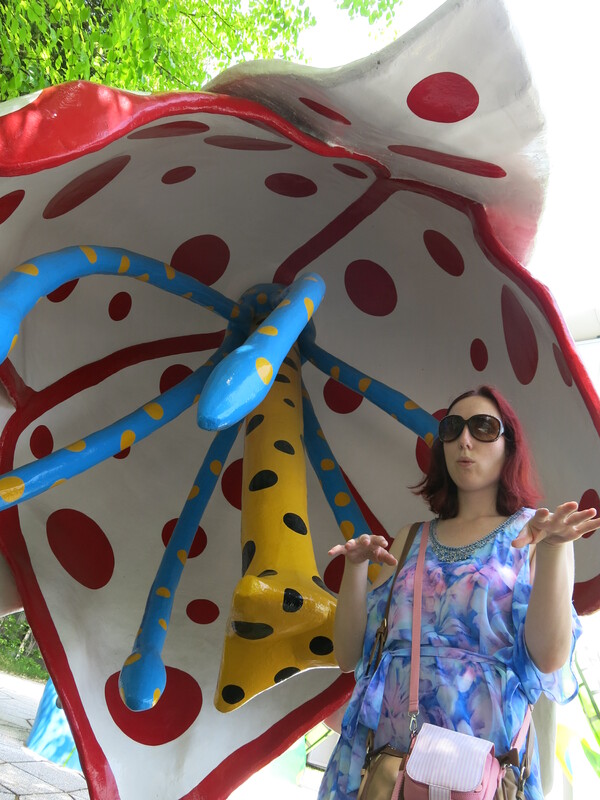 We also stopped off at the Matsumoto Perfoming Arts Centre looking for a cache we couldn’t locate. After searching outside the front of the building for about 10 minutes, we were starting to look a bit suspicious when we decided to have a look inside. Inside, it turned out they were preparing for a TED talk that afternoon, although it was 100% in Japanese and we had to be off anyway so didn’t hang around. The cache ended up being in the rooftop garden! 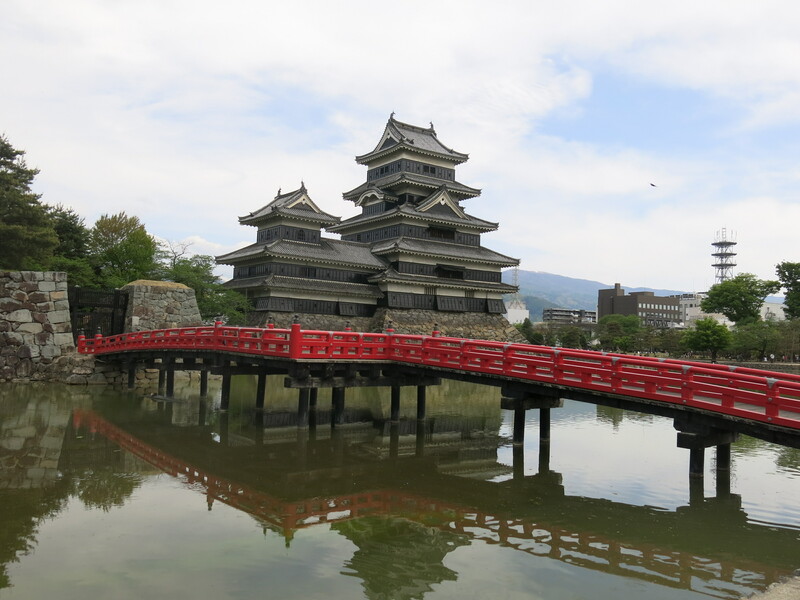 Our final stop in Matsumoto was of course the castle. 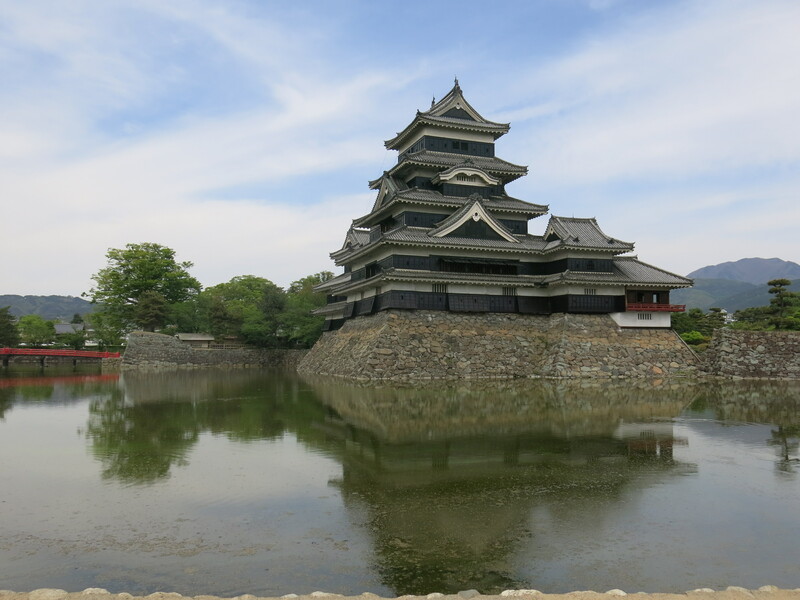 Over the years in Japan, I’ve found I’ve become a bit desensitized to temples and castles in that they’ve all become to appear pretty similar; Matsumoto castle, however, remained impressive and imposing next to the banks. Despite that, it wasn’t impressive enough for us to brave the three hour wait to look inside so we got an ice cream and headed back to the station.